Braunfels, Browning & Co. were wholesale hardware dealers in business in East Harlem at 1940 Park Ave. from 1906 to 1926. Founders were George Martin Braunfels (1866-1924) and Gilbert Browning (1881-1935). 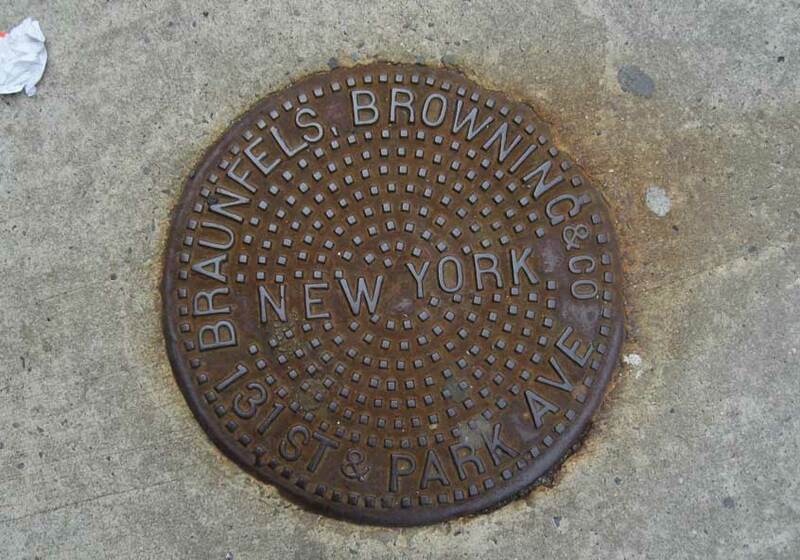 In 1926, shortly after the death of Braunfels, the business name changed to Browning Bros. Inc. Browning Bros. were in business until 1971, first at 1940 Park Ave., then (from 1954 to 1971) at 1881 Park Ave. (on the corner of 128th St.). Coal chute covers with the name Browning Bros. Hardware include those at 299 Broadway (near Duane St.), 261 W. 137th St. and 590 Ft. Washington Ave. The address of Browning Brothers is 131st St. & Park Ave.
G. Martin Braunfels appeared in the 1900 U. S. Census, where he was identified as George Braunfels, age 34, born March, 1866, Germany, immigrated 1885, naturalized citizen, occupation "hardware." He lived at 237 E. 24th St.. Manhattan. He also appeared in the 1910 census when he lived at 1983 Vyse Ave., the Bronx. He lived with his wife of 20 years, Irene, but the couple had no children. Two nephews, immigrants from Germany, formed part of the household. In 1920 Braunfels lived on Yonkers Ave., Tuckahoe, in Westchester County, New York. G. Martin Braunfels received a simple death notice in the New York Times, 25 Sept. 1924, reading, "Braunfels - On Sept 24, 1924, G. Martin Braunfels, at his residence, 48 Yonkers Av., Tuckahoe, N. Y., beloved husband of Irene Braunfels. Members of Henry Clay Lodge, No. 277, F. and A. M.: Jerusalem Chapter, No. 8, Columbian Commandery, No. 1, are requested to attend Masonic services to be held at his late residence, Friday, 8 P. M."
Gilbert Browning, a Yale graduate, had his biographical sketch printed in Yale's History of the Class of 1905, edited by Murray Sargent, 1908, "Gilbert Browning. Treasurer, Braunfels, Browning & Co., heavy hardware, 1940 Park Ave., New York City. Residence, 'The Barnard,' 71st St. and Central Park West, New York City. Unmarried. Gilbert Browning was born September 22, 1881, at St. Johns, Newfoundland, the son of the late James Browning, a biscuit manufacturer, who died in 1885, and of Mary (Topping) Browning. A brother, James Herbert Browning is in 1908 S. B. A. 1905. 'July 5, 1905, I got a job at U. T. Hunderford Brass and Copper Company, Park and Pearl Streets, New York City. Chief duties - weighing brass and copper and dusting off packages of tacks. Left there December 1, 1905. January 2, 1906, elected Treasurer of Braunfels, Browning & Company.' Member of Yale Club. …"
Gilbert Browning's obituary, New York Times, 19 Sept. 1935, read as follows, "Gilbert Browning, one of the leaders in the wholesale hardware trade in New York, president and general manager of Browning Brothers, Inc., 1,940 Park Avenue, died yesterday of heart attack at Chester, N. S., where he had been spending the Summer. Word was received by relatives here last night. He was born at St. Johns, Nfld., fifty-two years ago. Surviving Mr. Browning, whose home was in Greenwich, Conn., are his widow, Marjorie; two daughters, Alice and Jean; his mother, Mrs. James Browning of New York, and a brother, James H. Browning of Great Neck, L. I., vice president of the company. After his graduation from Yale Mr. Browning devoted himself to the hardware business. More than twenty-five years ago he established his own firm, which makes a specialty of heavy hardware. He was a director of the Long Island Hardware Company and vice president of Topping Brothers." Gilbert Browning's brother at Browning Bros. was James Herbert Browning (1885-?). Both brothers appear in the 1910 U. S. Census when they lived with their uncle, Joseph P. Topping, at 106 Central Park West, Manhattan. (106 Central Park West is the Barnard Apartments at the southwest corner of 71st St.) Like his brother, James H. Browning was born in Newfoundland, Canada, and was a graduate of Yale University (1908). In 1918 he registered for the World War I draft when he was a vice-president at Topping Bros., Wholesale Hardware, at 122 Chambers St., New York. On his registration James H. Browning gave his birth date as 19 Nov. 1885. Mary Topping Browning (1854-?) was the mother of Gilbert and John H. Browning, and the sister of the founders of the hardware dealers, Topping Bros., located in New York and Boston. These were Joseph Pattinson Topping (1857?-1911) and Frederick Topping (1852-1912). Topping Bros. in New York were located for many years at 92 Chambers St. and then 122 Chambers St. The business started as Topping & Fox in the mid-1880s (their partner was Walter H. Fox), then became Topping Bros. in 1893. Topping Bros. were located on Chambers St. from 1893 until 1922, then moved to 159 Varick St., where they were in business for another 50 years. Joseph P. Topping's obituary in the New York Times, 19 Aug. 1911, read, "Joseph P. Topping, 55 years old, Vice President of the hardware firm of Topping Brothers of 122 Chambers Street, died suddenly of heart disease Thursday at his home, 106 Central Park West. Mr. Topping was a member of the Hardware and Engineers' Clubs." Frederick Topping's obituary, 23 May 1912, was also brief, "Frederick Topping was found dead in bed at home in Summit, N. J., yesterday, from heart disease. Mr. Topping was 50 years old and was engaged with his brother in the wholesale hardware business at 122 Chambers Street, Manhattan. A widow, a son, and daughter survive." This ad for Topping Brothers appeared in the New York Central Railroad's Industrial Directory and Shippers' Guide, 1921.